Millennia ago, the survivors of a crash settled the planet of Denner's Wreck. Their descendants long ago forgot their own history. Centuries later, the planet was rediscovered by visitors who stayed -- and came to be called The Powers. The descendants of the original settlers soon learned to treat the newcomers like gods. Then, one fine day, Bredon the Hunter found himself caught up in the affairs of the Powers ­- at just the moment one of them went mad! With a new afterword by the Author. Previously published as Denner's Wreck. You can order ebook editions of Among the Powers from the following outlets. The links below will take you directly to the order links for this title. Among the Powers from the Apple iBook Store. 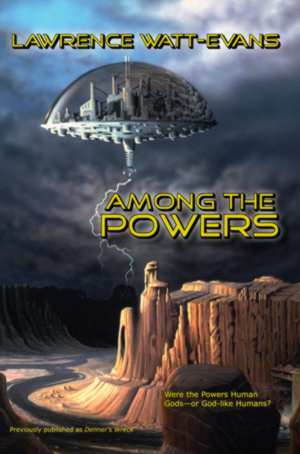 You may order the print edition of Among the Powers from FoxAcre Press, or from most major online booksellers. The links below will take you directly to the order links for this title.